In the United States any weapon manufactured prior to1899 is usually considered an antique. These firearms receive special exceptions to federal regulations. Australia, Canada, the Netherlands, Norway, the UK also have similar exceptions though the year of manufacture cut off varies slightly. The threshold is pre-1898 in Canada, and pre-1901 in Australia. England has exemptions for certain antiques but no specific year based cut off. Here are the exact guidelines from the United States Code for a firearm to be classified as an antique. A. Any firearm (including any firearm with a matchlock, flintlock, percussion cap, or similar type of ignition system) manufactured in or before 1898; and is not designed or redesigned for using rimfire or conventional centerfire fixed ammunition, or uses rimfire or conventional centerfire fixed ammunition which is no longer manufactured in the United States and which is not readily available in the ordinary channels of commercial trade. The NFA also dictates that “The term “firearm” shall not include an antique firearm..."26 U.S.C. § 5845(a). That whole “fixed ammo/ readily available” part is the source of a lot of confusion. One could argue that none of these weapons was designed to shoot modern ammo; almost all were based on black powder loads which are not readily available. Luckily to save the confusion a hair splitting the ATF has determined that any firearm made in or before 1898 is an antique, and not subject to the provisions of the gun control act of 1968, or the NFA. The only exceptions are machine guns, short barreled shotguns and rifles, and “destructive devices”. And of course the term “destructive device requires another set of inclusive specifications listed below. Keep in mind that like any other law it depends on what enforcement Officer or Official you ask. There is always a little room for interpretation and a lot of room for ignorance and preferential or selective enforcement. A missile having an explosive or incendiary charge of more than 1/4 oz. Any type of weapon by whatever name known which will, or which may readily be converted to expel a projectile, by the action of an explosive or other propellant, the barrel or barrels of which have a bore greater than one-half inch in diameter. A combination of parts designed and intended for use in converting a device into a destructive device and from which a destructive device can be readily assembled. 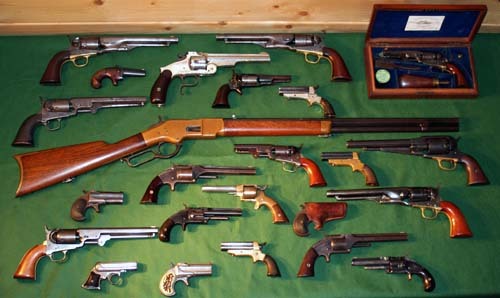 Antique firearms are used primarily for collection and display purposes. The ones that are designed for cartridge type ammunition are designed for use with black powder loads which produce less pressure and therefore do not require the metal to be as hardened and strong as a modern firearm. Plus they are over 100 years old! For these reasons anyone who is planning on firing an antique firearm should use only black powder loads. The firearm should also be thoroughly checked out by a gunsmith. This is not to say that all of these guns are unsafe to shoot, in fact some are probably as good or better quality than ones you would buy in a store today. A lot of people shoot their antique guns on a regular basis and I’m sure some are still used for hunting or self-defense. I use to carry and old Smith and Wesson model 1 ½ as my truck gun. One of the biggest benefits of collecting antique firearms is they are no longer even considered as firearms under law by the ATF and NFA. This means they have no jurisdiction over them and cannot control their sale, possession or transport. For you as a collector this is a huge advantage because you can buy them without any licensing requirements or background checks. No ATF forms to fill out or red tape to go through. You can also have them shipped directly to your house or ship them directly to your buyer using any shipping method you choose. I have received many antique revolvers in USPS flat rate mailing boxes right in the mailbox. Of course you want to check your state and local laws regarding this but most or all state laws mirror or reference the above definition and do not regulate their sale or transport. Of course I would recommend some self-imposed common sense guidelines when selling or shipping. I require a proof of age and photo ID to be sure that the person is at least 18. I would also NEVER ship a loaded weapon or even ship a weapon in the same container as ammunition. I make sure I communicate to the buyer that it is their responsibility to be sure they can legally possess such an antique. I also make sure I include in communications the following … “This Antique firearm is sold for collection and display purposes only. It should be thoroughly inspected for safety by a competent and qualified gunsmith if you plan on firing it. Ammo should also be verified by the gunsmith to ensure it is of the proper chambering and powder type”. Not all firearms of course have a date of manufacture stamped on them so sometimes you will have to research to find if a certain piece was manufactured prior to 1889. Some models were all manufactured pre-1889 and some you have to know the serial number range to determine if it qualifies. There is a handy list of a lot of popular firearm models I found on the Empire Arms website HERE https://www.empirearms.com/pre-1899.html , it was compiled by James Wesley Rawles. 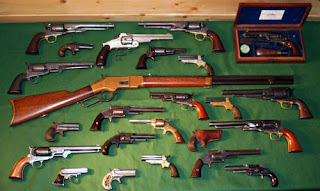 He also has a handy Q&A on Antique firearms qualifications that may cover some things I did not cover in this article. And replicas of pre-1899 firearms also. Thanks, I forgot to mention about the replicas! Awesome article, I am a big fan of this website, keep on posting that great content, and I'll be a regular visitor for a long time..
Shame there are no decent replicas made as air rifles.